The Horse Stopped Wall, located in Liangshan village and built about three thousand years ago, is a section of Cuiyun corridor of Jianmenshudao, one of the most beautiful and the oldest road in the northwest of China. The characteristics of the wall were “three ancients”, namely the ancient road, the ancient tree and the ancient traffic facilities. In the ancient China, the Horse Stopped Walls, just as the name implied, were a kind of military constructions to set to protect horses from falling off the cliff, similar to today’s super highway. They were usually more than one meter in height and 0.8 meter in width, and their length depended on the danger of the road. There were two types of the Horse Stopped Walls: soil walls which were constructed by pebbles and muds in the middle, and stone walls which were built by bluestones and mortar where the sticky-rice lime acted as adhesive and the lime was painted on the wall surface to draw people's attention. This wall in Jiange County was one meter in height and located at the road bends and only on one side of the road. During the Ming Zhengde Dynasty (A.D. 1506–1521), the governor Libi organized craftsmen to rebuild the ancient road. The wall still retains its original appearance and the sticky-rice lime remains integrated after thousands of years of erosion by its environment. It was recorded that sticky-rice lime mortar (SLM) was widely used in the ancient Chinese buildings such as tombs, the constructions of cities and water conservancy projects [1–4]. The method of preparation SLM was to cook the sticky-rice, boil to a paste, and then mix with sand and lime. Due to SLM’s high strength, good toughness and superior seepage-proof quality, it can also be called “Chinese concrete”. Archaeological studies showed that the SLM was used widely in the Northern and Southern Dynasties until modern times such as Kaiping Diaolou in the early 1930s, and it faded out of the historical stage with the development of the western concrete [5, 6]. However, SLM holds an important status and value in Chinese architectural history. Domestic and foreign scholars, especially conservators, have paid much special attention to it due to its excellent performance such as surface hardness, antibacterial activities, and environmentally-friendly characteristics. Scholars from National Cheng Kung University (NCKU) and Zhejiang University have conducted research works with SLM from the city walls constructed in the Song and Ming Dynasties. It was reported that sticky- rice played a crucial role in the consolidation properties of lime mortars [7–9]. 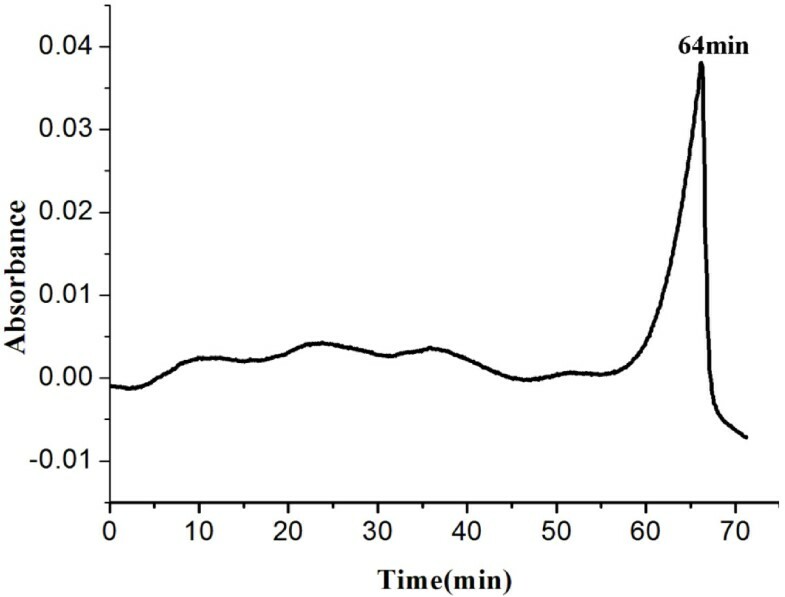 In this work, sticky-rice lime obtained from the Horse Stopped Wall in Jiange County was analyzed by Fourier transform infrared spectroscopy (FTIR), X-ray diffraction (XRD), thermogravimetry - Fourier transform infrared spectroscopy (TG-FTIR), scanning electron microscopy (SEM) for the first time. The aim of this work is to have a full understanding of the status quo of the materials used in the Horse Stopped Wall. The XRD pattern of samples, as illustrated in Figure 1, shows that calcite is the main mineral (signals at 2θ=23.1, 29.5, 39.5, 47.6, 48.6°). The signals at 2θ=20.8, 26.7, 39.4° correspond to quartz which came from soil. XRD patterns of SLM. X-ray diffraction patterns of SLM were evaluated by a DX-1000 diffractometer. The FTIR spectra of the bare sticky-rice and SLM are presented in Figure 2. The bands at 875, and 710 cm -1 were ascribed to the deformation vibration of CO32- and O-C-O of calcite. The infrared absorption bands at 1421cm -1 of calcite are shifted to 1448 cm -1. The reason that the asymmetric stretching vibration of ν (O-C) of CaCO3 was shifted to higher wavenumber could be that the organic materials in mortars caused the crystal deformation of CaCO3. The bands in the 1000–1150 cm -1 spectral region were ascribed to the stretching vibration of C-OH of polysaccharide which was the degradation product of sticky-rice. FTIR spectra for sticky-rice and SLM. The measurements were carried out with a Nicolet 6700 FTIR instrument. The spectra were recorded from 400 to 4000 cm-1 with a spectral resolution of 4 cm-1 and 32 scans. In order to confirm whether the lime had transformed into calcite completely, the pH of the SLM was calculated. The pH of the SLM was 11.73 meaning that the Ca(OH)2 was not transformed into CaCO3 completely. This result could indicate that the unreacted Ca(OH)2 could be wrapped by organic materials or else it should have been transformed into calcite in the air after such a long period of time. At the same time, the residual Ca(OH)2 maintained an alkaline environment which restrained the growth of the bacteria and conserved the SLM for such a long period of time. The I2-starch reaction has proven to be a powerful tool to show whether amylopectin, the main component of sticky-rice, existed or not. It is a very sensitive chemical reaction even though the amount of the iodine was only 4×10-5mol/l. The I2-starch experiment yielded a purple solution when the SLM was reacted with the iodine. The result of the I2-starch reaction supported the hypothesis that there was still sticky-rice in the samples after such a long period of time under the burial condition. More details are discussed in the following sections. Scanning electron microscopy (SEM) was employed to explore the microstructure of the SLM. Figure 3 shows the SEM micrographs of SLM. 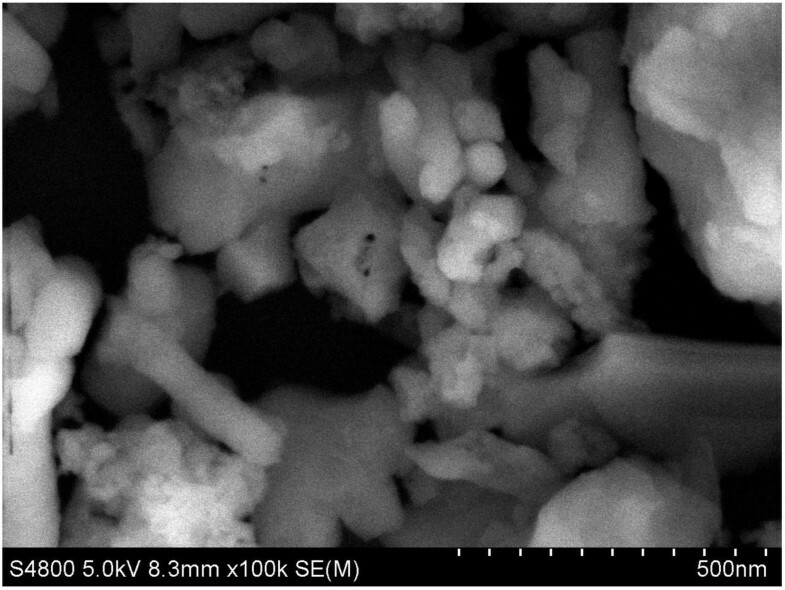 It can be seen from Figure 3 that the particles are small, and of irregular shape, which further suggests that the lime and/or calcite might be wrapped by sticky-rice. SEM image of SLM. SEM images were recorded with a Philips FEI INSPECT F instrument operated at 10 kV with a very thin gold layer deposited by sputtering under vacuum. Scale bars = 500 nm. We were not able to find out the exact initial ratio of each component in SLM, but TG could be a very useful instrument to investigate the composition of the mortar. Figure 4 shows the results of derivative thermogravimetry (DTG) as a function of temperature for the pure sticky-rice and SLM. It was found that the maximal decomposition temperature for the pure sticky-rice was at 257°C. It can be seen clearly that the decomposition of SLM involved three stages, and the maximal decomposition temperatures were found at 249°C, 395°C and 708°C respectively. The three stages seemed to correspond to the degradation of the organic component, the decomposition of Ca(OH)2, and the decomposition of the CaCO3, respectively. 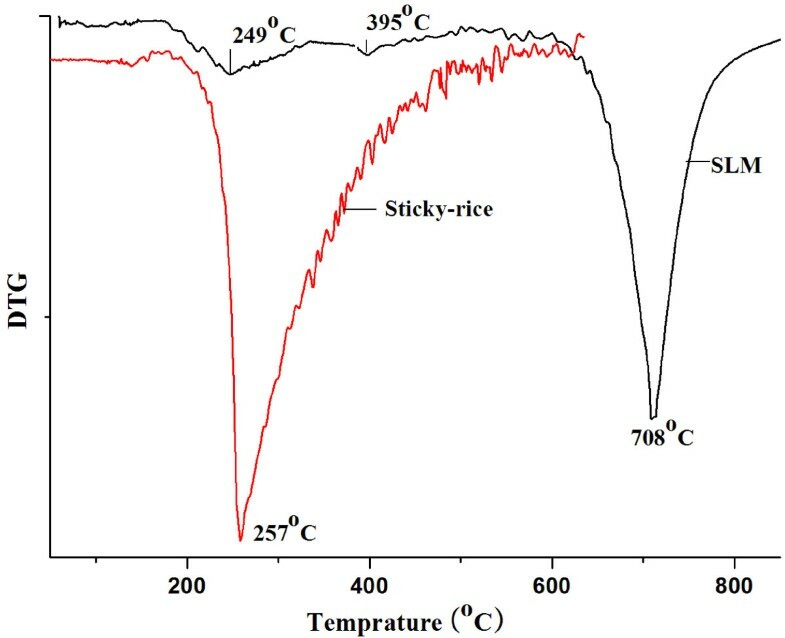 The maximal decomposition temperature for organic component in SLM was slightly lower than that of the pure sticky-rice, which could be attributed to the effects of the inorganic components. The organic component and CaCO3 constituted 2.7% and 78% of SLM mass according to the weight loss data, respectively. DTG curve of SLM. The derivative thermogravimetry was recorded using a TG 209 F1 (NETZSCH Instrument). 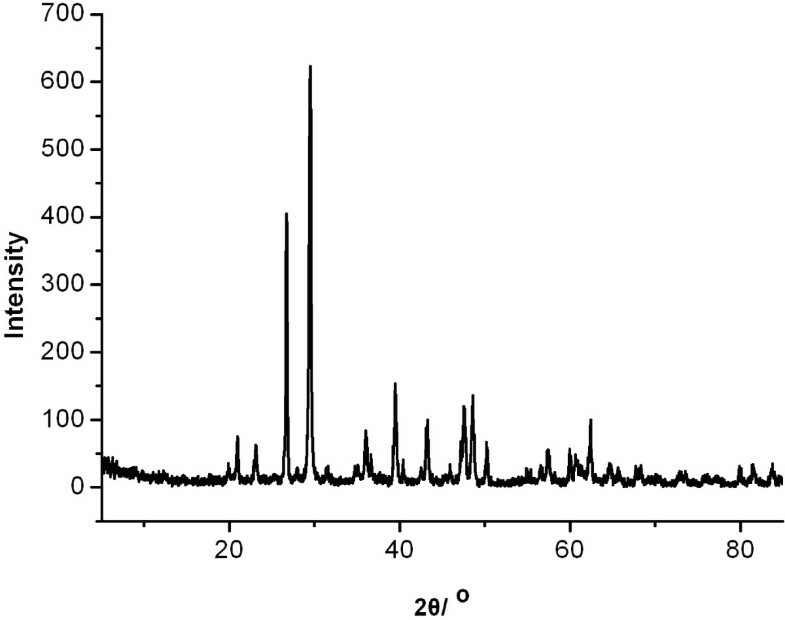 In order to further confirm the decomposition patterns, the FTIR spectra corresponding to the three decomposition stages were obtained by TG-FTIR. Figure 5 shows the change in absorbance for bands at 2359 cm -1of the FTIR spectra for the gas generated when heating the SLM. The band at 2359 cm -1 indicates the presence of CO2 gas streams released from the samples. When samples were heated during the first stage, the slowly change in characteristics of the band at 2359 cm -1 suggests the released substance containing CO2 gas, matching the decomposition of sticky-rice and its degradation products. When the SLM was further heated, at 43 min, CO2 (2359 cm -1) was disappeared, matching the second stage of the decomposition of Ca(OH)2. The intensity of absorption band at 2359 cm -1 increased quickly after the CO2 signal started to increase at 53 min, and the maximum absorbance was at 64 min. 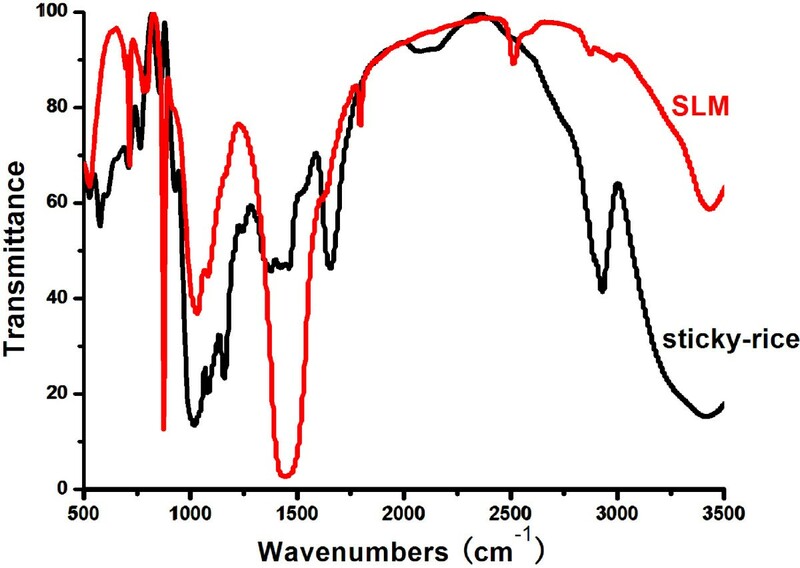 The results of the bands at 2359 cm -1 obtained by TG-FTIR supported the evidence that the SLM comprised organic, Ca(OH)2 and a large amount of CaCO3. Change in FTIR absorbance for bands at 2359 cm -1 while heating the SLM. The coupled TG-FTIR measurements were recorded using a TG 209 F1 (NETZSCH Instrument) interfaced to a Nicolet 6700 FTIR instrument. Mortar samples from the Horse Stopped Wall in Jiange County Sichuan Province were characterized for the first time. The results showed that the inorganic ingredients of the samples were mainly calcite and a small amount of lime, and that there was still a small quantity of sticky-rice. The lime had not been transformed into calcite completely according to the results of TG-FTIR and pH tests. The residual Ca(OH)2 maintained an alkaline environment which prevented the growth of bacteria and conserved the SLM. The reason that the mortar could resist damages from the natural environment for such a long period of time is the interaction of the sticky-rice mortar and calcium hydroxide and their resulting micro structure. We will further investigate the samples of the mortar to understand the properties of the ancient Chinese SLM in the future. Sticky-rice lime mortar was sampled from the Horse Stopped Wall ruins in Jiange. The sampling site was showed in Figure 6. Photographs of the Horse Stopped Wall in Jiange County and the sampling location. (A) the Horse Stopped Wall (B) the sampling location. XRD was recorded on a DX-1000 diffractometer equipped with a graphite monochromator and Cu Kα (λ=1.5418 Å) radiation. The generator was operated at 40 kV and 25mA. The samples were scanned at diffraction angle from 2° to 70° at the scanning rate of 0.06°/sec. SEM images were recorded with a Hitachi fields S-4800 instrument operated at 20 kV. The FTIR analysis was performed on samples using a Thermo Nicolet 6700 spectrometer. The spectra were recorded from 400 to 4000 cm -1 with a spectral resolution of 4 cm -1 and 32 scans. The coupled TG-FTIR measurements were carried out with a TG 209 F1 (NETZSCH Instrument) interfaced to a Nicolet 6700 FTIR instrument. The heating from room temperature to 900°C was conducted at a rate of 10°C/min in the TG 209 F1, under ultrahigh-purified nitrogen at a flow rate of 20 mL/min. The outlet gas cell was maintained at 235°C and placed inside the FTIR spectrometer. FTIR scans were made in the frequency range of 4000–400 cm -1 at approximately 25 s intervals to obtain time (or temperature) resolved FTIR spectra. This work was supported financially by the Younger Fund of the Ministry of Education (10XJCZH005) and the advanced interdisciplinary innovation research project of Sichuan University (skqy201216). Y-BL conceived the study, designed the experiments, drafted the manuscript; Y-JZ performed the experiments. Both the authors read and approved the final manuscript.